Roan’s high country is the native home of the Rhododendron catawbiense, also known as the Catawba Rosebay, Mountain Rosebay, or Purple Laurel. These plants display spectacular blooms in June and July and range in color from deep purple to pale pink to white. Bakersville resident Bob Hensley knows their beauty well. Not only does he lead botanical tours atop the mountain, he’s one of the dedicated volunteers behind the annual North Carolina Rhododendron Festival and its beauty pageant. This year marks the festival’s 65th anniversary, making it one of the longest running events in the High Country. The first step was to build a better route to the pinnacle. The one rugged road out of Roan Valley “wasn’t much more than a glorified pig path,” explains Hensley. The festival and pageant might have remained an obscure local event had it not been for the involvement of O.D. Calhoun, who owned movie theaters across North Carolina, including The Carolina Theater in Spruce Pine. To promote the festival, he worked with the Bakersville Lions Club, and called on his substantial contacts, including Walt Disney, who he’s said to have met at a film screening. Hugh Morton, who was beginning to develop Grandfather Mountain at the time, was also key in promoting the event. 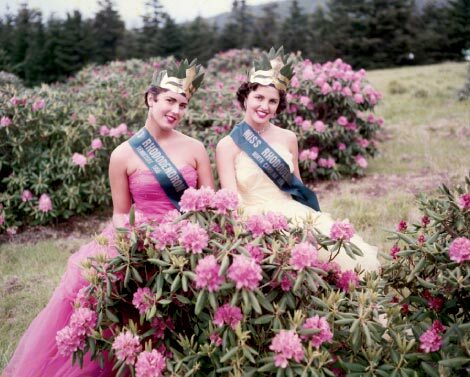 By the late 1950s, the festival was nationally known and the Rhododendron Queen pageant was second only to the Miss America contest in prizes and prestige. “The winner traveled all over the world,” says Hensley. “Not only coast to coast, but to Australia, Hawaii, even to England, where she was presented at court. From 1964 to 1969, the queen might travel in excess of 100,000 miles a year.” Calhoun’s friendship with Disney secured the queens a spot on a float in the Rose Parade until the late 1960s. With popularity came challenges, and the mountain’s delicate plants were threatened when a visit by Vice President Richard Nixon and his wife, Pat, boosted attendance. Although the celebration originated on the peak, a snowstorm during the June 1972 event forced organizers to reconsider the location. The contestants were freezing as they stood outside in their pretty dresses. And so it was decided to move the event to Bakersville, where it’s held today. The festival has continued to evolve over the years. Today, two queens are named, a Junior Queen who receives a $1,000 scholarship and Senior Queen, who wins a $5,000 scholarship. Numerous other events broaden the festival’s scope, including a 10K run, a street dance, golf tournament, car show, and a fair exhibiting art, mountain crafts, and an array of local foods. This year’s festival takes place June 17 and 18.